One of the few truly essential pieces of equipment for the VWC Recycling Centers is the huge baler at the Ben Lomond site. The baler creates large bales out of aluminum cans, plastic bottles, and cardboard to make the material easier to handle and transport, thus increasing their value and reducing costs. The Recycling Centers literally could not operate without this machine. The current baler is very old, doesn’t work well, and needs to be repaired repeatedly. It also creates safety issues because the workers have to climb into the baler to fix it. It is challenging to use because each baler must be “tied” by hand — meaning long thick wires must be fed into special slots to wrap around the bales and then be tied down by hand — a time-consuming and challenging process. Because of this situation, the RRC applied for a significant grant from the State Department of Resources Recycling and Recovery (Cal Recycle) to buy a much better baler that would solve many of the problems we have with the old one. 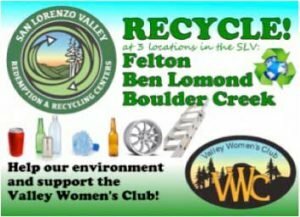 We’re happy to report that Cal Recycle recently awarded the grant to the VWC! Matt Harris, the Recycling Centers’ Director, and Ben Lomond Site manager, has located a replacement baler and is currently working with Cal Recycle to arrange funding. Typical of State grants, Cal Recycle will only reimburse for expenses already made. This means a bridge loan is needed to purchase the baler and qualify for reimbursement. VWC Board members are working with Liberty Bank to obtain a loan to buy the baler, which would then be repaid by the grant funds. This is a very, very exciting and welcome development for everyone who works at the Recycling Centers. We are optimistic that this will improve safety, provide bales that qualify for a higher value per ton, and reduce shipping costs — a great boon to the Centers.